Adelaide author and bluegrass guitarist John Bridgland has published a new and unique book on South Australia’s premier flat-top guitar luthier, Bryan De Gruchy. Bryan started making guitars in 1976. In the 35 years since then he has made about 600 and the high calibre of musicians playing his instruments highlights how respected he is among Australian and overseas musicians. One musician interviewed for the book, an Australian studio musician now living in Nashville, US, plays only De Gruchy guitars and the response to them in pro studios among famous musicians says everything about how successfully Bryan has achieved his goal to make great instruments. Bridgland has been a bluegrass guitarist and mandolinist for 40 years, but also is an editor – a useful combination when seeking to write a book about a once-in-a-generation luthier of Bryan’s standing. It’s my opinion, and one shared by others I interviewed for the book, that Bryan’s skills have resulted in a collection of flat-top guitars in Australia that will be highly collectable in future years. Through his devotion to the craft he has captured brilliant tone and projection, and consistently produced guitars of great character – John Bridgland. The fact that virtually every serious pro musician in bluegrass and acoustic country music in Australia uses one (or more) of his guitars says much about the quality of his work. Bridgland is a De Gruchy guitar owner, but also plays other major US brands. However, for recording, in his view there is simply no substitute for a De Gruchy instrument. Others agree. In the book I explore Bryan’s life, his craft skills and his approach to choosing the right woods for the tone he seeks. I also examine his passion for resonator guitars, resulting in a small but notable output of instruments that are, without question, the best hand-crafted resonators made in Australia today” Bridgland comments. The book also seeks to place Bryan’s 35-year contribution into an important context, given Adelaide’s well-known trio of instrument makers: Alan Funk (banjos); John Liddy (mandolins) and Bryan De Gruchy (flat-top and resonator guitars). Bryan has been crafting the longest and his legacy will last well into the 21st century, with future younger musicians likely to be keen to know more about the man. In years to come, the book probably will be the only source of information on this legendary luthier and his output. “Bryan doesn’t say much about his craft, but his guitars speak volumes,” Bridgland said. More information: email the author, John Bridgland. CD (read on your laptop): $18 plus $3 postage/packing. Photocopy, A4 spiral bound, gloss colour page plates, original photos, hand assembled, signed (author): $60 plus $10 postage/packing in SA (other states: please ask). International post rates: please ask. To contact the author, John Bridgland email jbeditor@senet.com.au. John Bridgland has been a journalist since graduating in Adelaide with a BA in 1979. He started his own business as a professional editor in Adelaide 18 years ago. John other passions include writing playing bluegrass and blues music. John first learned guitar at age 14, back in 1968 and became a bluegrass guitarist in bands with his brother Geoff Bridgland for some years. He then moved to electric country music (Telecaster and Fender Twin Reverb) for about 15 years, then back to bluegrass when he took up the mandolin. John has been a mandolinist and top tenor singer in Bluegrass Junction (Trev Warner’s band in Adelaide) since 1997 when the band formed. John has a deep interest in the mandolin of Bill Monroe, Sam Bush, Ricky Scaggs, David Grisman and Mike Compton. John tells us that he attended a three-day workshop with Mike Compton in Canberra in 2008 which really opened his eyes. In 2010 he bought a Zoom H4n digital recorder, and since then has recorded about 15 CDs featuring mandolin and guitar tune tracks (originals). As and professional editor, John has been editing others’ work for many years, and has written three books. The one that reflects his interest in music is Bryan De Gruchy, South Australian luthier. This has just been published (July 2013). Book authors say ‘Write about what you know’ and as a 43-year-playing guitarist, a De Gruchy owner, and long time friend of Bryan’s, it all has been useful background for a book. But all books are explorations of the subject of the book, and in collating much information about Bryan I learned a great deal more about the man and his craft. Bryan is an astonishingly good luthier, but shy about his abilities. His guitars are already collectable. In decades to come they will become even more highly sought after, because there are (relatively) so few of them compared to the output of the big companies – John Bridgland. While John wrote did all the work myself, but interviewed about 14 other musicians to collect their perspectives on Bryan’s skills (they are all players of De Gruchy guitars). They included musicians from Adelaide, but also others from Victoria and NSW, and an Australian living and working in Nashville, USA. I also invited close friend and Adelaide bluegrass guitarist Nick Cawthorne to contribute some words because he is not only a long-time player of DG guitars, but also someone steeped in the knowledge of guitar retailing in Adelaide, and Australia. Through their words, Bryan’s reputation is scrutinised and discussed. He clearly demands enormous respect around Australia. 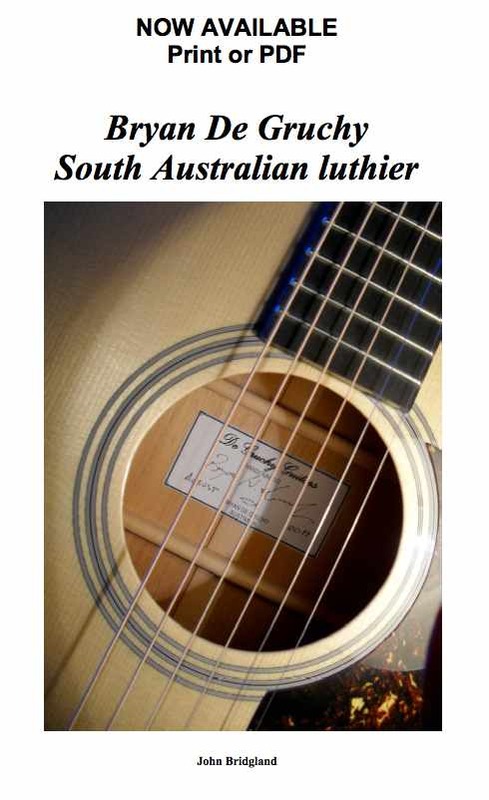 How long has Bryan De Gruchy, South Australian luthier taken to compile and write? The idea to write the book simmered in my mind for a few years, and once Bryan agreed to cooperate, then took about 12 months’ work, comprising about four major interviews, photo shoots, and several journeys to Harrietville (the bluegrass weekends) during which Bryan and I discussed many aspects of his life and work. I held other multiple interviews with other players in Adelaide or at Harrietville. Some interviewees also used email, which was useful. Bryan then read two manuscripts, and others proof-read the final draft before the book design commenced. Have you written any other books in the past? Yes. I have written two other books. One was on a residents’ association in Adelaide (a history), and the other was on a painter (an artist’s biography). Great idea John. When I lost my Martin D35 in a house fire Bryan made me a replacement, “The Phoenix”. It has improved over the last 23 years and remains the best bluegrass guitar I have heard.